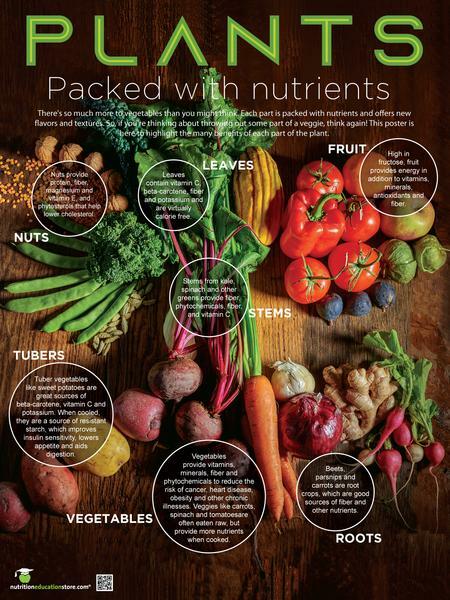 The Plants: Many Beneficial Parts poster is a beautiful visual for plant-based eating. The message goes beyond “eat more fruits and vegetables” to bring a positive message about how there are so many colorful and abundant choices you have for fruits, vegetables, legumes, grains, nuts, and seeds. The edible parts of vegetables are often wasted. You can eat the stems! And the leaves! A cooking demo and taste test would be great for introducing many new plant foods listed on this poster. Items like salads or crudite platters require no cooking equipment while soups or smoothies provide a palatable way to introduce more plant foods to the picky eater. Each part of the plant provides different nutrients, tastes, and textures. What’s an example of a tuber? A root? What nutrients do they provide? This will reinforce why eating a wide variety of plant foods is important. Use these tips from Lisa Andrews, MEd, RD, LD. Moving toward a plant-based eating pattern might mean venturing into unfamiliar territory. Start out by asking people to name each item on the poster. What are those fruits on the top right, below the tomatoes and apple? What kind of nuts are those on the top left? Which of these foods have you tried? Do you like them? Brainstorm different ways of preparing some of the foods pictured on the poster. Eat to Excel Bookmarks pack of 50 2"X7"
It’s Time to Change It Up!